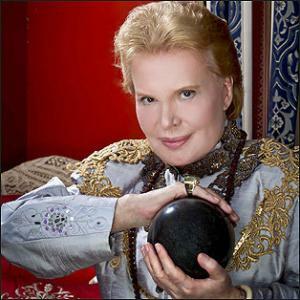 Walter Mercado Salinas was born on 9th March 1932, in Ponce, Puerto Rico, and is an astrologer, actor, writer, and dancer, best known to the world for appearing in TV shows talking about astrology. Have you ever wondered how rich Walter Mercado is as of early 2017? According to authoritative sources, it has been estimated that Walter’s net worth is as high as $5 million, largely earned through his successful career in the entertainment industry. Walter is the son of José María Mercado and Aida Salinas, who is of Spanish ancestry, therefore, making Walter half Spanish. After finished high school which he attended in his hometown, Walter enrolled university, and majored in psychology, pedagogy and pharmacy as well. Before his career began, he used knowledge from university to teach others, and also to study the human mind. He then started taking ballet and dancing lessons, and became one of the most prolific dancers, often teamed with dancer-comedian Velda Gonzales. His screen beginnings trace back to Puerto Rican telenovelas, including the “Un Adiós en el Recuerdo”, “Larga Distancia”, while he also started his own acting school called Walter Actors Studio 64. His career as an astrologer began quite accidentally; after one of the guests didn’t appear on the show hosted by Elin Ortiz, Walter took his spot, and made astrological predictions as a funny, dressed-up character, wearing fancy robes. From then on, he was the show’s regular. He began to present astrology predictions in “El Show de las 12” from 1970 onwards, and then switched to WKAQ-TV, Channel 2/Telemundo. Several years later, Telemundo changed its focus, and Walter was forced to take his work elsewhere, and found engagement at WRIK-TV, where he stayed for many years, building a reputation and also increasing his net worth. Little by little, Walter was seen and heard throughout Latin America and United States, but when Tommy Muñiz, bought the station, Walter stayed for only two years more, and then moved to WKBM-TV. From the mid- ‘90s, his show was aired through Univision, up until 2010, when he announced that he was leaving TV station. Four years later he entered into a partnership with Entertainment Events AZ, and since then has launched two websites www.passionlatinos.com, which is a dating site, and www.waltermercado.com, where his fans can easily read and hear their daily horoscopes, astrology predictions, and other things connected to zodiac signs. In the first month of operation, www.waltermercado.com was visited more than one million times. Walter has also authored several books, including “Enciclopedia de Walter Mercado” (1981), “Beyond the Horizon: Visions of the New Millennium” (1997), “El Mundo Secreto de Walter Mercado” (2010), and “Revista de Walter Mercado – Horoscopo Predicciones” (2014), the sales of which have also increased his wealth. Regarding his personal life, Walter changed his name in 2010 to “Shanti Ananda”, which on Sanskrit means Peace happiness. When it comes to his relationships, he has stated that he has maintained a “spiritual relationship” with Mariette Derotto, actress and dancer from Brazil; the two have worked together in a TV show. Back in 2012 he had problems with his heart, but since then has managed to recover, and continues to make public appearances.